Mike Babcock addressed the media after practice on Wednesday, discussing the new line combinations in practice (Johnsson-Tavares-Marner / Hyman-Matthews-Nylander / Marleau-Kadri-Kapanen / Lindholm-Gauthier-Brown), the team’s recent rut, the challenge against Tampa Bay tomorrow night, and more. What are you looking for with getting Zach Hyman back with Auston Matthews? Babcock: I think the big thing… I don’t know what I’m doing tomorrow. How’s that? But we took a look at it today. We haven’t played… We’ve been hit and miss since Christmastime. We didn’t feel our work ethic was up to a level to be proud of last game as a group. What makes that happen and what makes the group go, you don’t always know. If it’s just changing some lines around, then we’ll do that. We haven’t talked as a coaching staff since practice at all. We will do that. We have a nice two-and-a-half hour opportunity to do that, so we’ll get that figured out. If you do go with that line again, what made it so effective last year? Babcock: Just the cycle and three real good players working hard together. Obviously, Matty is a goal scorer and getting pucks in places around the net so you can do that, I think, is important. I think his game has really come on here of late. I think he is really starting to find some rhythm in his game. Whether people want to believe it or not, when you’re out for a long time, it takes time. Usually, you have an initial push and then… But I thought he’s been skating way better. We are always looking to get more out of everybody. Like I said, I don’t think our team has been as good as we’re capable of being. We need to find a way to take a step, and we’re playing a real good Tampa team. John Tavares talked about getting to another level. What does that look like? Babcock: I would agree with him. We haven’t taken a step like some of the teams who came back with more intensity since Christmas. We haven’t done that. Therefore, we’ve been left behind. We have got to dig in and find another level. How has Nazem Kadri’s role changed from last year to halfway through this season? ?Babcock: Last year, he played with Leo and they were always kind of in a matchup role. This year, he is not. He hasn’t been in as much of a matchup role. When you look at our group, we need more from a number of guys. He is one of those guys. But he is an important player for us. He needs to be important and he needs to be feeling good about himself and playing the right way. 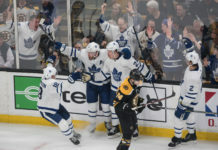 What do Jake Gardiner and Nikita Zaitsev need to do to get back to where they were earlier this season? Babcock: I think just play. Jake Gardiner is a real good player for us. I say this all the time. If you are a skilled forward, you need to be on the ice with guys like Morgan and Jake because they get you the puck all the time. It didn’t go as good for him this last little bit. Shake it off and let’s get playing. The other morning, before you guys played Colorado, Jared Bednar was saying it is time for his guys to basically put up or shut up because they’d lost nine of ten coming in. Are you at that point with your people, knowing they’re saying the right things but it’s just not happening on the ice right now? Babcock: I just think we need to play harder. Did we have a built-in excuse when Freddy was out? I don’t know. Maybe. I didn’t think we tried to use that. I thought we tried to play real well and be stingy defensively. In saying that, I think we can play — as Tavares said — at another level. I think we can play harder and I think we can work harder. That’s what we want from our group. The other thing about it is we want to be proud guys when we leave the rink. If you don’t put it all in, you can’t be proud when you leave. How much focus do you spend looking at the last time you guys played Tampa when, by and large, it looked like you were the better team? Babcock: What we did here is the two previous games like we always do here this morning. On the flight, we will re-do our game against them and we’ll have a pretty good handle by the time we play them tomorrow as to what is going on. Is there a lot you can point to with the team from that game? Babcock: What we’re going to do is look at it and see what we can use and what we can’t use. Obviously, when you look at the Colorado game, we’re not going to use a lot of that. We’ve got room to use [the last game vs. Tampa].